Edvard Munch is best known as being a Norwegian born, expressionist painter, and printer. In the late 20th century, he played a great role in German expressionism, and the art form that later followed; namely because of the strong mental anguish that was displayed in many of the pieces that he created. Edvard Munch was born in Norway in 1863, and was raised in Christiania (known as Oslo today). He was related to famous painters and artists in their own right, Jacob Munch (painter), and Peter Munch (historian). Only a few years after he was born, Edvard Munch's mother died of tuberculosis in 1868, and he was raised by his father. Edvard's father suffered of mental illness, and this played a role in the way he and his siblings were raised. Their father raised them with the fears of deep seated issues, which is part of the reason why the work of Edvard Munch took a deeper tone, and why the artist was known to have so many repressed emotions as he grew up. In 1885, Edvard Munch traveled to Paris, and was extremely influenced by Impressionists such as Claude Monet, Edouard Manet, and followed by the post-impressionism artists Vincent van Gogh, Paul Cezanne, and Paul Gauguin. In fact, the main style of Munch's work is post-impressionism, and focused on this style. From about 1892, to 1908, Munch split most of his time between Paris and Berlin; it was in 1909 that he decided to return to his hometown, and go back to Norway. During this period, much of the work that was created by Edvard Munch depicted his interest in nature, and it was also noted that the tones and colors that he used in these pieces, did add more color, and seemed a bit more cheerful, than most of the previous works he had created in years past. The pessimistic under toning which was quite prominent in much of his earlier works, had faded quite a bit, and it seems he took more of a colorful, playful, and fun tone with the pieces that he was creating, as opposed to the dark and somber style which he tended to work with earlier on during the course of his career. From this period, up to his death, Edvard Munch remained in Norway, and much of his work that was created from this period on, seemed to take on the similar, colorful approach which he had adopted, since returning home in 1909. A majority of the works which Edvard Munch created, were referred to as the style known as symbolism. This is mainly because of the fact that the the paintings he made focused on the internal view of the objects, as opposed to the exterior, and what the eye could see. Symbolist painters believed that art should reflect an emotion or idea rather than represent the natural world in the objective, quasi-scientific manner embodied by Realism and Impressionism. In painting, Symbolism represents a synthesis of form and feeling, of reality and the artist's inner subjectivity. Many of Munch's works depict life and death scenes, love and terror, and the feeling of loneliness was often a feeling which viewers would note that his work patterns focused on. These emotions were depicted by the contrasting lines, the darker colors, blocks of color, somber tones, and a concise and exaggerated form, which depicted the darker side of the art which he was designing. Munch is often and rightly compared with Van Gogh, who was one of the first artists to paint what the French artist called "the mysterious centers of the mind." But perhaps a more overreaching influence was Sigmund Freud, a very close contemporary. Freud explained much human behavior by relating it to childhood experiences. 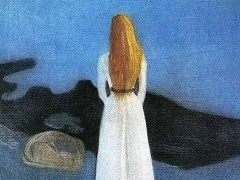 Munch saw his mother die of tuberculosis when he was 5, and his sister Sophie die of the same disease when he was 14. Munch gives the By the Death Bed and Death in the Sickroom a universal cast by not specifically depicting what he had witnessed. Several versions of The Sick Child are surely his sister. 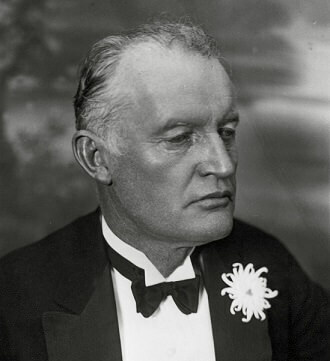 Edvard Munch passed away in 1944, in a small town which was just outside of his home town in Oslo. Upon his death, the works which he had created, were not given to family, but they were instead donated to the Norwegian government, and were placed in museums, in shows, and in various local public buildings in Norway. In fact, after his death, more than 1000 paintings which Edvard Munch had created were donated to the government. In addition to the paintings that he had created during the course of his career, all other art forms he created were also donated to the government. A total of 15,400 prints were donated, 4500 drawings and water color art was donated, and six sculptures which Edvard Munch had created, were all turned over to the Oslo government, and were used as display pieces in many locations. Due to the fact that all of this work which Edvard Munch had created, was donated to the Norwegian government, the country decided to build the Munch Museum of Art. This was done to commemorate his work, his life, and the generosity which he showed, in passing his art work over to the government, so that it could be enjoyed by the general public, rather than be kept locked up by the family. Although the art which he did donate, was spread throughout a number of museums and art exhibits, a majority of them were kept in Oslo. And, most of the works which were donated by Munch, were placed in the Munch Museum of Art, to commemorate the work he did, as well as the unique style, and the distinct movements which he introduced to the world, through the creations which he had crafted. Copyright © 2011-Present www.EdvardMunch.org. All Rights Reserved.